Η SRT ανακοίνωσε πως το όνομα που πήρε τους περισσότερους ψήφους σχετικά με τον διαγωνισμό που είχε βγάλει για το νέο μπλε χρώμα της Viper, είναι το “Competition Blue”. Συνολικά περισσότερες από 11.000 προτάσεις κατατέθηκαν online για το πως θα μπορούσε να ονομαστεί το νέο μπλε χρώμα, με το Competition Blue να το σκέφτεται ο Patryk Skarzynski από το Σικάγο. Ο νικητής του διαγωνισμού κέρδισε ένα VIP ταξίδι ώστε να δει ως καλεσμένος της SRT Motorsports, τον 24-ωρο αγώνα της Daytona τον ερχόμενο Γενάρη, μαζί με την σχεδιαστική ομάδα της SRT Viper. 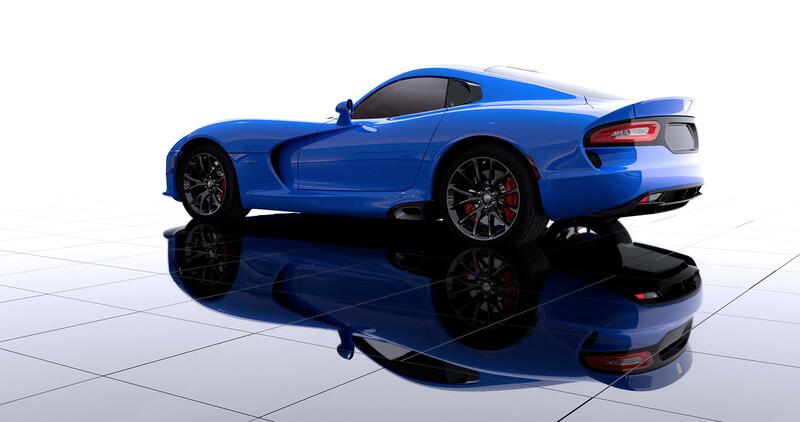 November 14, 2013 , Auburn Hills, Mich. – Fans have voted and today Chrysler Group’s SRT brand has announced that Competition Blue wins as the designation for the new exterior color on the 2014 SRT Viper. Patryk Skarzynski from Chicago submitted Competition Blue in the “SRT Viper Color Contest.” More than 11,000 names for the new blue exterior paint color were submitted and Skarzynski was the first to submit Competition Blue as an entry in the contest. In addition to having his name become part of Viper history, Skarzynski has won a trip to the 2014 Rolex 24 Hours at Daytona at Daytona International Speedway to experience the race with the SRT Viper design team. 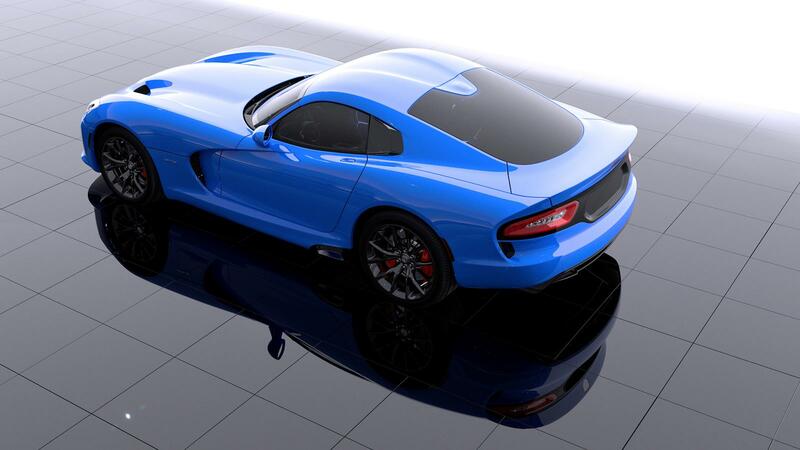 The “SRT Viper Color Contest” launched in October, giving SRT enthusiasts the chance to put a name on the new blue exterior color for the 2014 SRT Viper. The top three finalists were chosen by the SRT team. The public then voted for their favorite name among those top three finalists viawww.driveSRT.com/colorcontest. 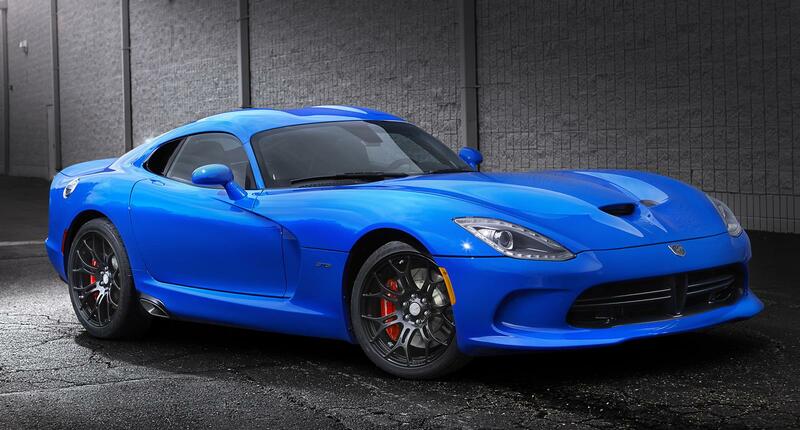 The new blue exterior paint color, now named Competition Blue, was featured on a SRT Viper GTS in the Mopar display area of the 2013 Specialty Equipment Market Association (SEMA) Show that recently took place in Las Vegas. Among the accessories on the SRT Viper GTS at SEMA is a Mopar carbon fiber X-brace in the engine compartment that adds strength and structural stiffness, and delivers a 50-percent weight savings over the stock X-brace. 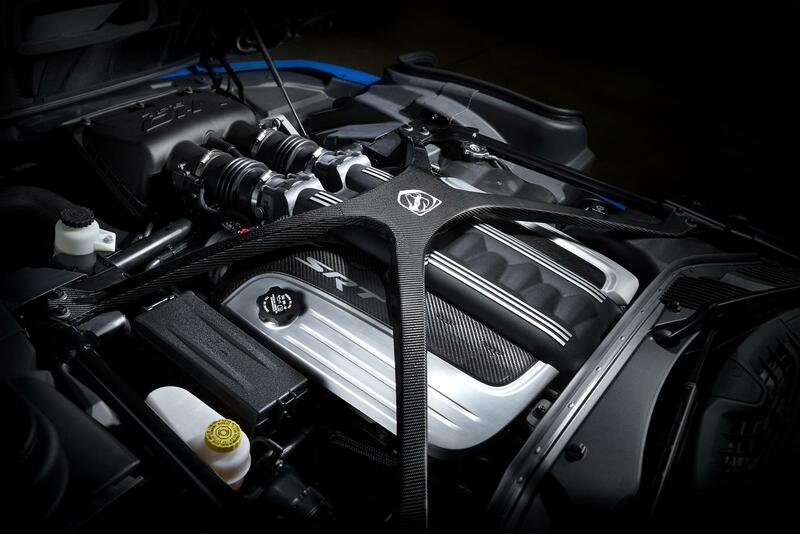 A silver Stryker logo on the X-brace harmonizes the X-brace and the valve covers, which have exposed carbon fiber and a brushed-aluminum finish with an SRT decal. Inside, a Mopar stainless-steel pedal kit with rubber grip inserts provides ample grip with added style. A Mopar carbon fiber satchel sits between the driver and passenger seat to provide extra storage. Aluminum doorsill scuff plates from Mopar complete the additional interior equipment. About SRT Viper The fifth generation of iconic American-built supercar returned in 2013 as the SRT (Street and Racing Technology) brand’s flagship performance machine with more power and performance, superior craftsmanship, new technologies and creature comforts. Power comes from the all-aluminum, 8.4-liter mid-front V-10 engine delivering 640 horsepower and 600 lb.-ft. of torque – the most torque of any naturally aspirated sports-car engine in the world, to produce the best power-to-weight ratio of any Viper ever. Standard safety features include electronic multistage stability control, traction control and new 4-channel anti-lock brake system (ABS). Two new models of the iconic supercar are hand-built at the Conner Avenue Assembly Plant in Detroit – the Viper’s home since 1995. Both SRT Viper and SRT Viper GTS models offer new interior and exterior designs incorporating premium materials and new exterior surfaces with aerodynamically functional details that are beautifully integrated into the high-tech carbon fiber and aluminum skin. On the inside, designers and engineers strived to rethink all its touch points and upgrade all its material appointments and technologies. The Viper GTS model adds many premium features including a leather wrapped interior, five mode electronic stability control and a two mode adjustable suspension. About SRT Brand The Chrysler Group’s SRT (Street and Racing Technology) brand uses a successful product development formula featuring five proven hallmarks: awe-inspiring powertrains; outstanding ride, handling and capability; benchmark braking; aggressive and functional exteriors and race-inspired and high-performance interiors to remain true to its performance roots. The 2014 SRT lineup features five vehicles that are world-class performance contenders and bring the latest in safety technologies and creature comforts. The Chrysler 300 SRT, Dodge Challenger SRT 392, Dodge Charger SRT and Jeep® Grand Cherokee SRT join the flagship SRT Viper, which made its highly anticipated return to the high-performance sports car market in 2013. About Mopar Brand Mopar is Chrysler Group LLC’s service, parts and customer-care brand and distributes 280,000 parts and accessories. With the creation of the industrial alliance between Chrysler Group and Fiat S.p.A., Mopar is extending its global reach, integrating service, parts and customer-care operations in order to enhance dealer and customer support worldwide. Mopar’s global portfolio includes more than 500,000 parts and accessories that are distributed in more than 130 markets. Mopar is the source for genuine parts and accessories for Chrysler Group brands as well as Fiat brands.